Recipe discussions in any culture can inspire debate. But bring up the subject of a carbonara recipe with a Roman and suggest an ingredient or technique that diverges from his or her own, and you’ve got a passionate fight on your hands. The fact is, there is no universal or original recipe for carbonara. Generally, the pasta is spaghetti or rigatoni. Guanciale is the pork of choice for most, but some do use pancetta. Almost every version uses black pepper, though some contemporary chefs use white instead. Yolk-only versions are just as common as whole egg; and some chefs use only Pecorino Romano, while others mix it with Parmigiano-Reggiano. Because there is no strict definition, every cook is free to make this dish his or her own. And in Rome, that quest has become the object of playful experimentation. We now have “carbonara pizza,” ravioli filled with carbonara sauce, and even a cocktail, Carbonara Sour di Co.So. The very idea of these innovations may make purists shudder, just the way they must have when carbonara first burst onto the scene in the mid-twentieth century. The origins of the dish are as elusive as the perfect recipe. By most accounts, it was first served in Rome in the late 1950s or early 1960s. A popular legend holds that American soldiers invented it after World War II, mixing their bacon rations with powdered eggs. It’s a fun story, but hard to prove. Other myths give the credit to carbonari (charcoal makers), but our friend and scholar Jeremy Parzen, has another theory: the word carbonari had multiple meanings in nineteenth- and twentieth-century Italy; the carboneria were also members of a Neapolitan secret society. Does this fact, coupled with a cheese and beaten eggs dish in an early nineteenth-century Neapolitan cookbook mean a precursor to Rome’s carbonara was invented in Naples? It’s impossible to say, which only makes the debate over its components and origins more heated. What we can say for sure is that carbonara is in an exciting period of evolution at the moment, as new techniqes and ingredient proportions are applied to a classic dish. The amount of guanciale today’s chefs use in their recipes has grown with respect to the past, while it is increas ingly common for the same chefs to discard some of the rendered guanciale fat in order to make the rich dish a touch lighter. Oh, the irony! Of the many versions we enjoy, we find chef Flavio Di Maio’s version at Flavio al Velavevodetto in Testaccio most satisfying because he transforms this heavy flavor bomb into a seemingly light and elegant condiment, relying on whole eggs and a splash of water to thin the normally dense sauce. We’ve adapted his recipe into a foolproof, consistently excellent version for the home kitchen (the Zabaione Method), but we’ve also provided an alternative method for preparing the dish so you can do a bit of your own experimenting with this ultimate classic. 1. Heat the olive oil in a small skillet over low heat. When the oil begins to shimmer, add the guanciale. Cook, stirring, until golden brown, about 8 minutes. Remove from the heat and allow the guanciale and its rendered fat to cool in the pan. If desired, remove some of the rendered fat and discard. 2. Meanwhile, bring a large pot of water to a rolling boil over high heat. Salt the water. When the salt has dissolved, add the pasta and cook until al dente. Bring another large pot of water to a simmer over low heat. In a large stainless steel bowl, or the top of a double boiler, beat together the eggs, 1 cup of the Pecorino Romano, a pinch of pepper, and ¼ cup water. Place the egg mixture over the simmering unsalted water, taking care to avoid direct contact between the bowl and the water. Whisk the egg mixture continually until it thickens and coats the back of a spoon. Remove from the double boiler. Add the guanciale, rendered fat, and al dente pasta to the egg mixture, stirring to coat. 3. Plate and sprinkle each portion with some of the remaining Pecorino Romano and pepper to taste. Serve immediately. 1. Heat the olive oil in a large skillet over low heat. When the oil begins to shimmer, add the guanciale. Cook, stirring, until golden brown, about 8 minutes. Remove from the heat and allow the guanciale and its rendered fat to cool in the pan. If desired, remove some of the rendered fat and discard. 2. Meanwhile, bring a large pot of water to a rolling boil over high heat. Salt the water. When the salt has dissolved, add the pasta and cook until al dente. 3. While the pasta is cooking, in a medium bowl, beat together the eggs, 1 cup of the Pecorino Romano, a pinch of pepper, and ¼ cup water. Add the egg mixture to the pan with the cooked guanciale. 4. When the pasta is cooked, drain it and add the pasta to the pan and stir continuously over low heat, slowly heating the egg mixuture, but taking care not to scramble it. When the egg begins to adhere to the pasta and to the sides of the pan, turn off the heat. 5. Plate and sprinkle each portion with some of the remaining Pecorino Romano and pepper to taste. Serve immediately. You want the sauce to be loose enough to thoroughly coat the pasta, but not too runny. The trick to carbonara is to apply enough heat to the egg mixture to thicken it but not enough to make the egg scramble. When cooking the egg mixture in a pan, avoid nonstick materials and select a pan that conducts heat evenly. 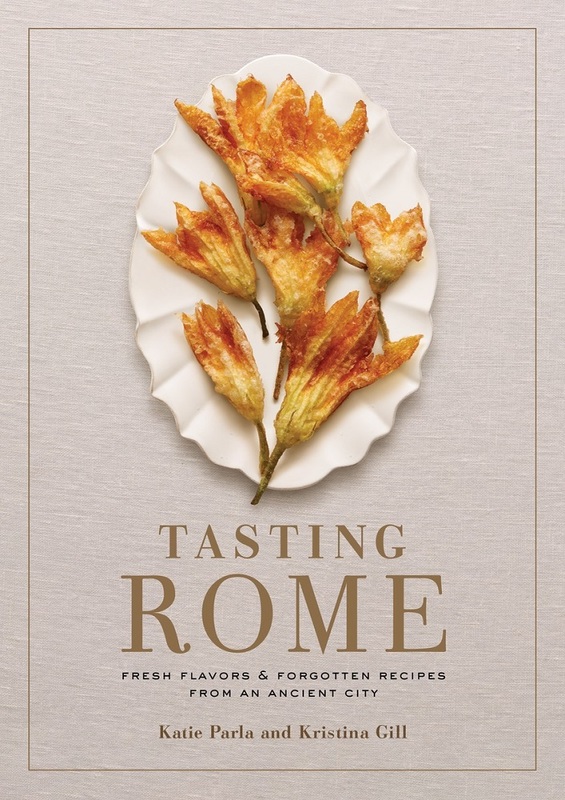 Tasting Rome is a love letter from two Americans to their adopted city, showcasing modern dishes influenced by tradition, as well as the rich culture of their surroundings. Even 150 years after unification, Italy is still a divided nation where individual regions are defined by their local cuisine—mirrors of their culture, history, and geography. But the cucina romana is the country’s greatest standout. Speakeasies, ten-table restaurants, and street food stalls may not be the first things that come to mind when you think of Rome, but these new realities have joined the traditional bars and trattorias of the Italian capital as bastions of great food and drink. In Tasting Rome, journalist Katie Parla and photographer Kristina Gill capture Rome’s unique character and truly evolved food culture—a culmination of two thousand years of history. The recipes here, each selected for the story it tells, acknowledge the foundations of the cuisine and demonstrate how it has transitioned to the variations found today, ranging from genuine classics to fascinating but largely undocumented Libyan Jewish fare to centuries-old offal preparations, and so much more. Part cookbook, part travel memoir, this book transports all of the flavors of Rome into your kitchen.